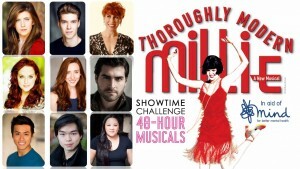 Showtime Challenge: 48-Hour Musicals - Say ‘Hello’ to the Priscilla Girls! Showtime Challenge / News / Say ‘Hello’ to the Priscilla Girls! Sara Morley will play Cora. Tash Holway will play Ethel Peas. Hannah Nuttall will play Gloria. Emily Watkins will play Lucille. Gabrielle Pemberton will play Rita. Chloe Porter will play Ruth. They will be joined on stage by Amy Perry as Millie, Robert Colvin as Jimmy, Carly Thoms as Miss Dorothy, Suanne Braun as Mrs Meers, Will Kenning as Trevor Graydon, Joanna Reyes as Miss Flannery, Cletus Chan as Ching Ho, Andy Yau as Bun Foo and West End star Anna-Jane Casey as Muzzy.